When you walk into our new store at 4620 E. Speedway Blvd. in Tucson, Arizona, you will immediately notice that the entire back wall is painted in faux stone to look like a castle wall. A wall like this sets the tone of a room and can set the stage for a home that is dedicated to the pursuit of Medieval history. 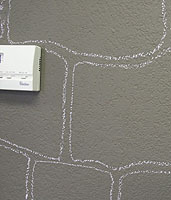 We had a lot of fun painting the wall with this very easy technique that anyone can do and we think that you will like it, too. It took three of us about 6 hours over a three day period to finish the wall. One person can do it alone over a weekend, but it is much easier if you have a team, as you will see. It is so easy that even little children can help. 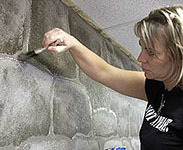 Step 1 To begin, patch any holes or cracks in your typical textured drywall. Mask the baseboards, ceiling edges, and corners with wide masking tape. Lay out drop cloths to protect carpet, tile, and furniture. 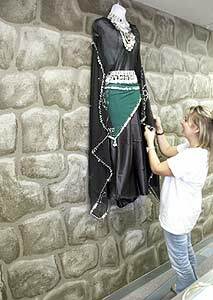 Paint the wall with the base color using a roller for the large areas and a trim brush for the edges. Allow it to dry from several hours to overnight. 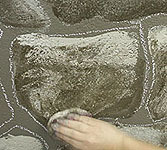 Step 2 Draw irregular stones with chalk leaving a finger width between the stones for the mortar. (Note: Real castles don't have mortar between the stones, but it looks better in this faux style to leave mortar spaces.) Though I varied the shape and size of each stone, I used a 10" x 14" piece of cardboard to judge the size of the stones to keep them roughly uniform in size. I drew them rapidly so they would be randomly shaped and I rounded the corners of the stones. If there was a large gap between stones, I filled it with a small stone. Beware that too much fussing at this stage ruins the natural stone effect. You should stand back from time to time to see if you like the overall look. Fix any shapes that are too extreme or too regular. Step 3 Now for the fun part. Pour some light, medium, and dark color paint into three plastic cups. You will use the medium for touch up and the other two will be used to give the stones dimension. 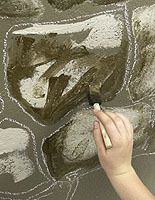 Using a 1" or 2" flat brush, rapidly apply light colored paint to the top and across the interior of the stone as in the picture. Work on no more than three stones at a time. Step 4 Switch to another small brush loaded with dark paint and apply rapid strokes of paint to the bottom and sides of the stone. Add a dab or two to the inside of the stone. Leave some of the base coat showing. If you have a couple of helpers let one paint the light color and one paint the dark color while you do the next step. Step 5 Scrunch up a plastic shopping bag into a ball the size of a lemon and pounce up and down on the wet paint to create a stony texture. 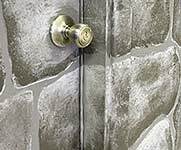 Plastic bags work better than rags or paper towels for creating a rough stone texture. Add more paint as necessary and pounce to get the effect you want. This may mean adding some base coat if your shadows or highights get too strong. If you use a plastic bag in each hand you can pounce even faster. This is the messiest and the most fun part of the job. Take turns when your arms get tired. Don't worry about going outside the lines. You will fix that in the next step. Continue your designs over door frames, weather strip, and doors if you want to make them almost disappear. Prop the door open until the paint is completely dry. If you what to emphasize an architectural detail like a door frame, you can draw smaller stones around the sides of the door and one long flat stone over the door for a lintel. Paint these stones with a slightly different base coat color to make them stand out. Step 6 Use the base color to touch up the mortar that was inadvertently texturized. Wait a for the paint to dry completely then clean off the chalk lines with a damp sponge. Add additional shadows and highlights as you see fit. When you are done, carefully remove the masking tape and clean all of your brushes with detergent and water. Properly dispose of the leftover paint. 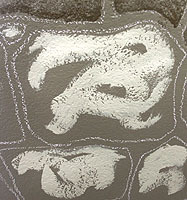 We used Glidden Evermore Interior Flat from Home Depot in "Fauna" color for the warm grey base color, "Pebble Mosaic" color for the shadows, and a mixture of White and "Fauna" for the highlights. I've kept a little of each shade for future touch ups. My two helpers were Laurel Shank and Leanna Stetson who dove into this project with much enthusiasm and made it lots of fun for me. Since they are Chivalry Sports customer service representatives, when you call or visit the store you will probably speak to one of them. If you want to add this article to your list of favorites or email it to a friend, please use this permanent URL, https://stores.renstore.com/-strse-template/0607A/Page.bok. Permission is granted by the author to quote from this page or use it in handouts as long as you include a link back to Renstore.com.